Location/Size: Encompasses most of the Alaskan panhandle. 17 million acres; wilderness, 5.7 million acres (before new plan). Main Activities: Kayaking, hiking, wildlife observation, bear viewing, eagle viewing, whale watching, birding, flightseeing, boat tours, fishing. Gateway Towns/Getting There: Ketchikan, Petersburg, Wrangell, Sitka, Juneau, and Haines. Vehicle and foot access via A.M.H.S. ferries, scheduled air service from Anchorage (via Juneau to smaller towns), vehicle access to Haines via Haines Highway from Alaska Highway. Forest access by hiking and backpacking from towns, charter-plane air service, boat drop-offs, and shuttles; sea-kayak and tour-boat access to many points; ferry access. Facilities, Camping, Lodging: Information centers in Juneau, Ketchikan, and Sitka; bear-viewing facilities at Anan and Pack Creek; numerous Forest Service roads on several islands. Numerous reservable backcountry cabins and several designated campgrounds. Headquarters and Information: 648 Mission Street, Ketchikan, 228-6202; Forest Service Information Center, 101 Egan Drive, Juneau, 586-8751; Southeast Alaska Discovery Center, 50 Main Street, Ketchikan, 228-6214; www.fs.fed.us/r10/tongass; see the Appendix for several ranger district offices. Encompassing almost the entire panhandle, Americas largest national forest is also its most magnificent. The beautiful Inside Passagea maze of interconnected channels and sheltered watersprovides travel routes among forested isles, sparkling peaks, massive glaciers, and windblown waterfalls. The forest lands are rich in wildlife, including large numbers of brown and black bears, Sitka black-tailed deer, moose, lynx, and mountain goats. Humpback whales share the waters with seals, otters, and porpoises. The largest concentrations of bald eagles in the world soar along the shores or perch high atop the old-growth Sitka spruce and western hemlock. Water is the defining feature of the Tongass. The frequent rains feed thousands of streams and waterfalls. Snows pile layer upon layer onto the icefields of the coast ranges and St. Elias Mountains. The icefields, in turn, squeeze scores of glaciers through precipitous defiles toward the sea. Rainbows are there one minute and gone the next as squalls blow past gaps in the cloud cover. The weather can indeed be broken and fitful as the clouds driven in from the Pacific by the prevailing westerlies run up against the ragged landscape. The Tongass includes two major national monuments and several designated wilderness areas, all offering potential rewards to the explorer. Admiralty Island National Monument and Misty Fiords National Monument earn descriptive sections of their own in this chapter. Larger wilderness areas are written up with the communities that serve as the best gateways. Smaller designated wilderness areas are described below. Information, cabin reservations, and certain permits can be obtained through Tongass National Forest offices. Adjustments in the final Tongass management plan may result in the expansion of some of the following areas. Chuck River Wilderness (74,298 acres)Essentially stretching Tracy ArmFords Terror Wilderness to the crest of the divide between Endicott Arm and Stephens Passage, Chuck River protects the south shore of Endicott Arm and the inner two-thirds of Windham Bay. 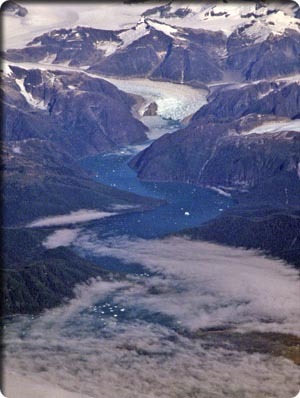 Also protected is much of the Chuck River watershed south of Windham Bay (see Tracy ArmFords Terror Wilderness, below). Coronation Island Wilderness (19,232 acres)Coronation Island, Warren Island, and the Maurelle Islands are a rugged trio of designated wilderness areas spread across Iphigenia Bay, west of the northern half of Prince of Wales Island. Each is windswept and rugged, exposed to the open ocean, and difficult to reach. Sitka, Kake, and Hollis are the closest towns with regular ferry service, all at least 50 air miles away. Floatplane, chartered boat, or serious kayaking are the only ways to reach these wild destinations. During much of the year, floatplane access is difficult or impossible due to rough seas. Endicott River Wilderness (98,729 acres)Contiguous with Glacier Bay National Park, the wilderness protects all of the Endicott River watershed, which drains eastward from the Chilkat Mountains into Lynn Canal, north of Juneau. From its mouth, the Endicott and its many tributaries branch upward through wet, forested, 15-mile valleys to the open peaks and passes of the divide. The source of the Endicott is in a wide, boggy flat that gives way gently through Endicott Gap to Main Valley, which drains into Adams Inlet of Glacier Bay. 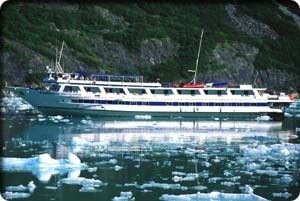 Haines, Juneau, and Gustavus are the nearest towns with regular ferry service. Access is by chartered boat, small plane, or sea kayak, and then on foot. Karta River Wilderness (39,889 acres)Five backcountry cabins and several miles of trail are found between Karta Bay and Salmon Lake in the center of Prince of Wales Island. The peaks around this protected watershed reach 3,800 feet. Hollis receives regular ferry service and is a 25-mile charter boat or kayak trip from the trailhead. Overland (no official trails) access is possible from the south or north via Forest Service roadssome of the many that lace this most heavily exploited of the Southeastern isles. Fishing, exploring, and camping are good options here. Kuiu Wilderness (60,851 acres)Along with Tebenkof Wilderness to the north, the Kuiu Wilderness protects a large portion of Kuiu Island. Deep bays and inlets provide ideal waters for extended kayak trips. A 3-mile portage connects Affleck Canal in the south with Tebenkof Bay to the north, and also connects the two wilderness areas. Kayak access to hidden coves can be combined with bushwhacking hikes to exposed 2,000-foot summits. The closest town with regular ferry service is Kake on Kupreanof Island, 45 air miles to the north. Access is by floatplane, chartered boat, or extended kayaking. There are no cabins or interior trails. Maurelle Islands Wilderness (4,937 acres)Numerous small islands and tiny islets beckon the adventurous kayaker (see Coronation Island Wilderness, above, for details). Petersburg CreekDuncan Salt Chuck Wilderness (46,777 acres)This popular wilderness lies directly west of Petersburg and is easily accessible by trail after a short crossing of the Wrangell Narrows. The watershed of Petersburg Creek is protected, as is a small divide and the corresponding basin to the west, which includes the North Arm of Duncan Canal and "Salt Chuck," a 4-mile-long tidal flat. Western boat or air access is possible via Duncan Canal. The wilderness and surrounding non-wilderness land has several miles of trail, a difficult 15-mile portage from Petersburg to Duncan Canal, and three backcountry cabins. Pleasant-Lemesurier-Inian Islands Wilderness (23,096 acres)Essentially contiguous with Glacier Bay National Park to the north, this three-unit wilderness preserves the forested isles of Icy Strait. Gentle Pleasant Island, directly south of Gustavus, is the largest of the three units. Lemesurier Island, the middle of the three, is steeply sloped with a 2,180-foot peak in the middle. The Inian Islands are further west, receiving the brunt of wave action from the open ocean, but offering several sheltered channels to kayak explorers. Gustavus is the obvious gateway of choice, with access by charter boat or sea kayak. There are no cabins or trails. South Etolin Wilderness (83,371 acres)South of Wrangell, the southern third of Etolin Island and surrounding smaller isles are preserved in this lovely wilderness. The many passages and small islands make an ideal region for sea kayaking, set as they are between the sheltered waters of Clarence Strait and Ernest Sound. South Etolins interior features several high-country lakes and exposed peaks that reach 3,700 feet, though access is difficult. Wrangell is the closest town with regular ferry service. Access is by floatplane, chartered boat, or multiday kayak trip. South Prince of Wales Wilderness (90,996 acres)The watershed that drains into Klakas Inlet of Cordova Bay is protected, as are scores of small islands and peninsulas on the southwest coast of Prince of Wales Island. Steep cliffs and rugged headlands are found at the wilderness and islands southern tip which confronts the open ocean of the Dixon Entrance. The ruins of a village and cannery can be visited, though there are no interior trails or backcountry cabins. The closest town with regular ferry service is Ketchikan. Taking the local ferry from Ketchikan to Hollis allows road access to Hydaburg and a 25-mile kayak or charter boat trip through sheltered waters to the wilderness. Tebenkof Bay Wilderness (66,839 acres)Contiguous with Kuiu Wilderness to the south, Tebenkof Bay offers excellent kayaking in the sheltered waters along the intricate coastline (see Kuiu Wilderness, above, for details). Warren Island Wildernesses (11,181 acres)About 10 miles long and 5 miles wide, this empty isle has 2,329-foot Warren Peak as its exposed summit (see Coronation Island Wilderness, above, for details).